Age relaxations applicable as per govt norms. Apply through ONLINE application registration mode. By written test, skill test, computer test and personal interview. Age relaxations applicable as per norms. Application Fee Rs.500 for UR / OBC ; Rs.300 for SC / ST. There is no fee for Physically Abled candidates. Written examination will be held in Bengaluru, Belagavi, Kalaburgi, Mangaluru and Mysuru. Apply through ORA Only (online registration application). Online exam centers are Bangalore, Mysore, Davanagere, Mangalore, Hubbali, Belagavi, Gulbarga. Selection through Online Aptitude Test. Questions will be in english only. Wrong answers will carry negative marks (0.25). This management trainee positions are purely contract basis for 2 years. You can apply along with your Bio-data. You can also use the application form provided here. Candidates will be shortlisted, based on their educational qualifications and experience. Qualified shortlisted candidates will be called for personal interview. This plumber post is permanent. Cut of date for Age and Educational Qualifications are 1st July 2014. Maximum Age limit for SC / SCA / ST is 35 years; MBC / BC is 32 years. Deputy Manager (Dairy Chemist) - 4 Posts(1 UR ; 1 SCA Widow ; 1 MBC ; 1 BC) - Basic Pay 9300 Grade Pay 4400 Pay Band II - Post Graduate in Dairy Science / Dairy Chemistry / Chemistry / BioChemistry /Bio-Tech / Quality Control. Fill the form and enclose all necessary documents and send to the The Manager, 55, Guruvappa Street, Ayanavaram, Chennai 600 023 on or before the due date. Selection on based on the academic qualification (90 marks) and Personal Interview (10 marks). Application Fee Rs.250 by Deman Draft. Postings are in Trichy, Perambalur, Ariyalur and Karur Districts. Age Limit : 30 years for UR ; all others no age limit. Fill the form and enclose all necessary documents and send to the The General Manager, Tiruchirappalli District Co-operative Milk Producers' Federation Ltd (TDCMPF) Pudukkottai Road, Kottapattu, Trichy 620 023 on or before the due date. Selection on based on written test. Deputy Manager (Dairy Chemist) - 1 Posts(UR) - Basic Pay 9300 Grade Pay 4400 Pay Band II - Post Graduate in Dairy Science / Dairy Chemistry / Chemistry / BioChemistry /Bio-Tech / Quality Control. Fill the form and enclose all necessary documents and send to the The Manager, Tiruchirappalli District Co-operative Milk Producers' Federation Ltd (TDCMPF) Pudukkottai Road, Kottapattu, Trichy 620 023 on or before the due date. Application Fee Rs.300 by Demand Draft for UR / OBC candidates. There is no application fee for SC / ST / Internal candidates / PH candidates. Application Form enclosed, fill the form, enclose necessary documents and forward to The Director Finance, LMRCL Lucknow. Online Application Registration will start from 28th April 2015. Typewriting and shorthand is desirable qualifications for Junior Assistant Post.Kindly superscribe "Post Applied for Junior Assistant "
Bangalore candidates may forward their applications to "The Regional Manager, Co-optex Regional Office (TNHWCS Ltd.) No.138, Govindappa Road, Gandhi Bazaar, Basavanagudi, Bengaluru 560 004, Karnataka". 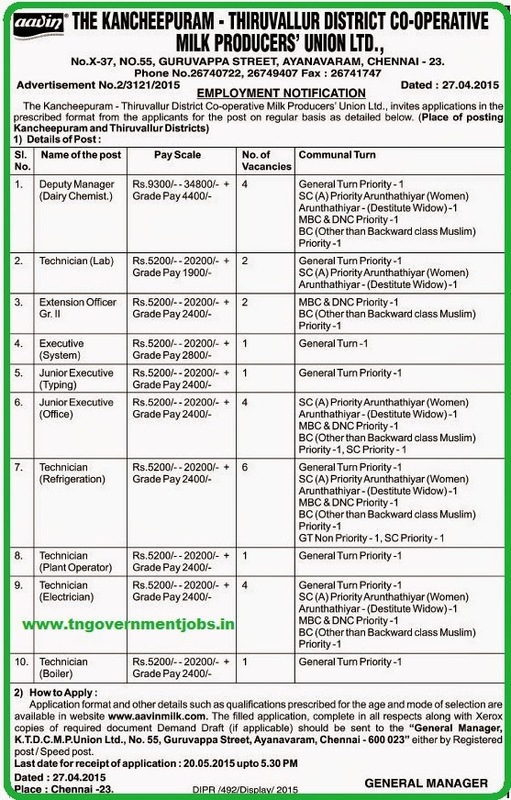 Mumbai candidates may forward their applications to "The Regional Manager, Co-optex Regional Office (TNHWCS Ltd) No.204, Udyog Mandir, No.2, 7 – C, Pitamber Lane, Mahim West, Mumbai 400 016, Maharashtra"
Vijayawada candidates may forward their applications to "The Regional Manager, Co-optex Regional Office (TNHWCS Ltd) Door No.29-2-5, 1st Floor, Post Box No.404, Ramamandiram Street, Governorpet, Vijayawada 520 002, Andhra Pradesh"
Roaster System will be followed as per government norms.Typewriting and shorthand is desirable qualifications for Junior Assistant Post.Kindly superscribe "Post Applied for Junior Assistant " or "Post Applied for Marketing Assistant". Application Forms to be addressed The General Manager (HR), TNPL, kagithapuram, Karur 639 136, Tamilnadu. Applications are available in Guindy Office from 11.00 am to 5.00 pm in all working days at free of cost. 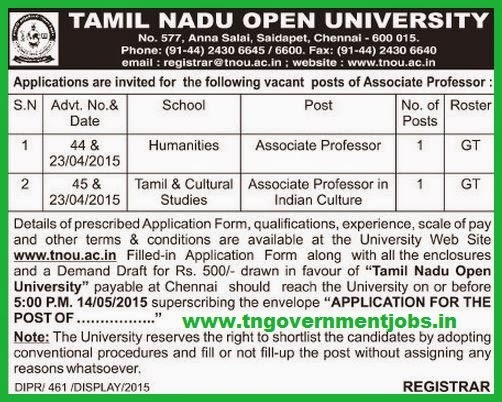 Qualification and Salary as per government of Tamil Nadu norms. Application fee Rs.1500 for UR / OBC ; Rs.750 for SC and ST candidates. Application fee to be paid in the form of Demand Draft.